The great thing about Video Editing is, it has become so accessible, that you can now even edit Videos on a Laptop. Back in the old days, the only way you could edit your analog video, was by using cutting machines that were huge and heavy, and unbelievably expensive. You needed a team to operate all the Video Editing machinery. 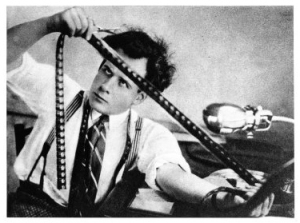 With modern day computers, digital video and the speed at which Computer Technology is evolving, anyone can be a Video Editor, at least from a technological standpoint. It doesn’t matter if you are editing your birthday video, a documentation for a local wildlife broadcaster, a commercial for the new big Brand’s washing machine or edit huge Hollywood productions. There’s a Computer and very specific kind of hardware components for anyone and every kind of budget. The same can be applied to Video Editing Software. It does not matter if you are using Windows Movie Maker, Sony Vegas, Adobe Premiere Pro, Avid, Davinci Resolve or any other of the gazillion Video Editing Applications out there. All of these run on a Computer that you can get off the shelf. And let me tell you this right now: The best Computers for Video Editing aren’t all that expensive anymore. Not for Professionals – because they earn their money with it, and a great Computer is just worth every penny – and not for Video Editing Amateurs, because a Computer that you can edit a Home-Shoot Smartphone Video on, really doesn’t have to be expensive. If we want to build the best Computer for Video Editing, the first step is to analyze what Hardware your Video Editing Software actually uses the most and in what way. Adobe Premiere Pro. It is a very popular Video Editing Software, that many professionals and also amateurs edit in and is perfect for our analysis because lots of other Video Editing Apps use the Hardware in very similar ways. Let’s take a look at how I myself would Edit a Video in Premiere Pro, and we can go from there and take a closer look at what these steps imply, hardware-wise. This is a very rough workflow of the basic steps a Video Editor would be doing throughout a typical day, nothing fancy. The Software reads Data (the Footage) from your Storage Medium. Your Editing Software has to decode this footage. The Software then manipulates this Footage depending on the effects and color-grading you are using (if at all). This manipulated footage is then usually stored in the Memory (RAM), so you have a real-time experience when playing back the timeline. Save the finished encoded Data to the Storage Medium. It is these 6 simple steps, that we will have to optimize as much as possible to build our Best Computer for Video Editing. This is an easy one: Your Storage Device and the transfer Bus are responsible for the speed at which your footage can be read from a Storage Medium. The Hard Disc Drive is the slowest of these three options. Sequential Read speeds are usually around 150Mbyte/s. Random Read and Write is a multitude Slower. Hard Drives have great Cost/GByte, but rank last place in speed. Hard Drives are great for Archiving and Backing up large Data, that doesn’t have to be accessed all the time, but I would not recommend using an HDD as an active working Device for your Footage. 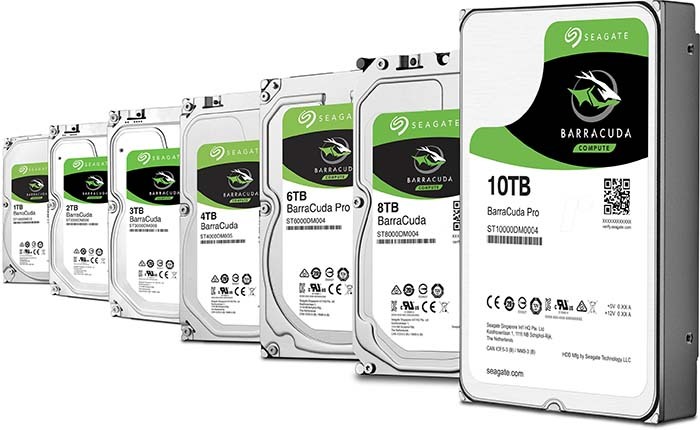 Good HDDs can usually be found from Seagate or Western Digital, such as the Seagate Barracuda Series or the Western Digital Blue or Red Series. You can get HDDs in sizes up to 14TB, though the best price/GByte mark lies somewhere around 8TB. A Solid State Drive (SATA) is usually about 4 Times faster than an HDD and will speed up the reading of your Footage a lot. SSDs aren’t all that expensive anymore and prices are coming down quite fast. I recommend to minimally get an SSD as your active Footage Storage Medium. The Samsung 860 EVO or PRO, that come at reasonable prices in sizes from 256GB up to 4TB is a great SSD with high-end performance. 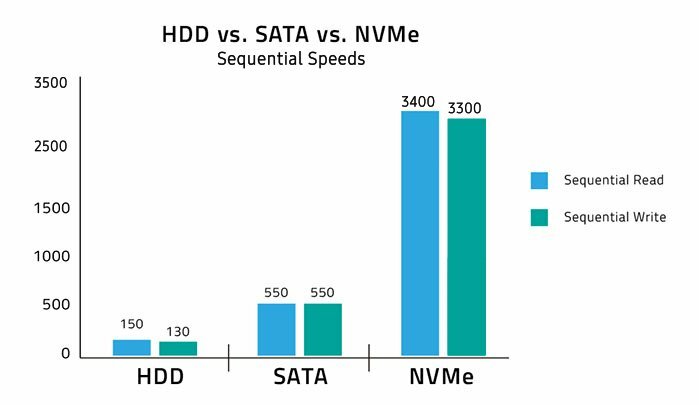 NVMe SSD (Non-Volatile Memory Express) Solid State Drives, basically are SSDs on Steroids. They use a different Socket / Bus on the Mainboard and can reach much higher performance than a regular SATA SSD. They can be over 5 Times faster than even SSDs at sequential read and write speeds and will make reading large Footage an easy task. Although slightly more expensive than SSDs, they are definitely worth the money. Highly recommended! Great NVMe SSDs that I can recommend is the Samsung 970 EVO or PRO that comes in sizes from 500GB to 2 TB. NVMe SSDs will help you read even RAW Footage in 4K+ Resolutions in real time. Let’s start with putting a Samsung 970 PRO 1TB into our Best Computer for Video Editing. That way we should already be able to rule out the Storage Medium as a bottleneck. What’s next in our Video Editing Workflow? Now, reading alone usually won’t be enough to be able to see the footage, as almost every Footage is encoded in some way. If it’s encoded (usually mainly to save space) it has to be decoded before playback and viewing. Decoding is something that is usually done by the Processor (CPU). Unfortunately, there is no one CPU that is best for all types of Footage “Codecs” or Video File types. If you are using Cinema DNGs or other Image Sequences then it is usually the other way around: This type of Footage likes high Core-Clocks as in the Intel i7 8700K or the recently released i9 9900K. H.264, DNxHD /HR or ProRes Footage seems to be easy enough to decode, that almost all CPUs perform more or less the same here. To summarize: For a smooth playback experience only, we would have to know what type of Footage we usually use and depending on this, get the right CPU. BUT. Of course, playing back the Footage gets us only half way there. We want to apply some Effects to our Footage! If your Edits are Effects intensive, then you will want a maximum Core-Clock CPU. Effects are calculated in hierarchical order and most can’t be outsourced to other cores, meaning one Core will be crunching all the numbers for all the Effects on that one Frame. Seems like a pretty basic setup. The thing is, you can’t have 4 Cores calculate these 4 Effects simultaneously on the same Frame because they are all dependent on each other. You first have to Time-Remap your footage before you can edit the Brightness / Contrast and so on. This is one Core stepping hierarchically through the effects chain. Sure, other cores can start working on the effects of other Frames, but some Effects aren’t just dependent on each other on a per frame basis, but in-between frames. Having a high-clocked CPU will benefit you in Effects heavy Projects. Good choices here are the i9 9900K with 5GHz Turbo Boost Clock, the 9700K, or the i7 8700K with 4,7GHz Turbo Boost Clock. But of course you have to take the type of footage you are using into account: If you are using hires RED Footage, you should use a high-Core-Count CPU for best decoding experience. A fairly high clocking CPU with lots of Cores, such as the Intel i9 9980XE. For NON-RED users, it seems the i9 9900K is currently the goto CPU for Video Editing. It really is quite unpractical. Because CPUs have to stay inside specific thermal- and power-limits, there is no one CPU that has lots of cores AND a very high core clock. This would of course be optimally for Video Editing, and for many other use cases too, of course, but we have to find the best middle ground for us here. This is usually done automatically by the Editing Software you are using. This is usually known as Caching. All cached Frames are saved, in your RAM, so the next time you want to view a frame or a sequence, the Software doesn’t have to calculate everything again, but can read the already calculated result from RAM, which is much faster. 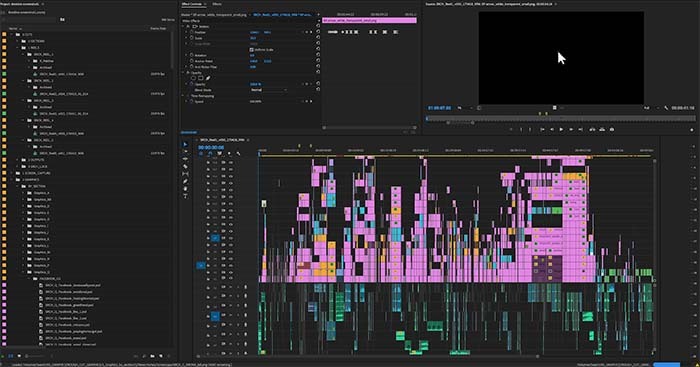 When you play back the Timeline, usually the Editing Software looks ahead and calculates the frames to come. Sometimes frames are calculated right away and others have more effects on them, this is why the Editing Software in a way “buffers” ahead, as not to interrupt your real-time playback experience. RAM is so fast, you could get the worst kind of RAM and it would still be fast enough for almost any of your Editing needs. The only important thing, when buying RAM for Video Editing, is getting enough. As we discussed above, the RAM has to be big enough to store the cached result. If it is not large enough, the Software will Cache to your Disc, and that will slow things down a lot! 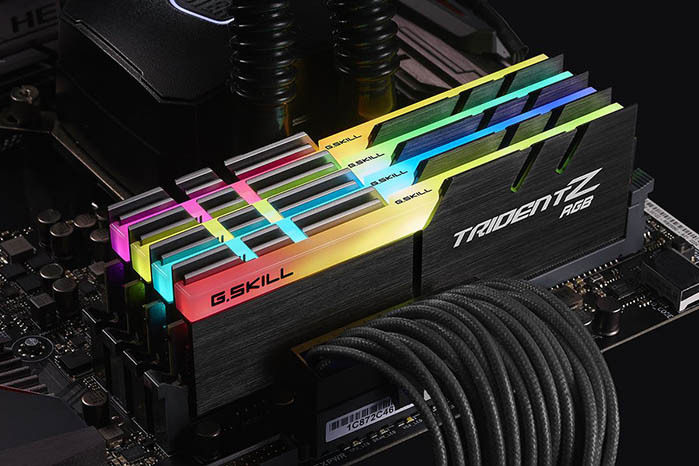 Check this in-depth article on how much RAM you should be getting. These 3 Steps – Reading, Calculating, Caching – will be done again and again, during Video Editing Sessions. Rendering out your Timeline uses the same steps that we have already discussed above. You read your footage, apply the Effects and store the resulting frames into a Video File. If the Timeline has already been cached, all the Video Editing Software has to do, is read the cached Frames from RAM and save them to the Video File. Now, there is one more thing that is important in Rendering out your Video, namely the Encoding Stage. There are lots of different Codecs available for encoding. Some popular ones include H.264, H.265, WMV9, ProRes, DnxHD, Sorenson, Cinepak and many more. Most of the more popular codecs use the possibility of saving only the difference between two frames instead of saving each frame in its entirety, as the difference between two frames is usually much smaller in file size. Others block Pixels together or reduce color and contrast information to save space. But these are only some of many tricks how Codecs keep your Filesize low and provide a smooth playback experience. The RAM too should always be fast enough as to not slow down the rendering process. Of course, the RAM has to be large enough to fit the Frames that are being rendered. For Rendering out your projects, having higher core-counts is the way to go. But there seems to be an optimum around 16 / 18 Cores and a slightly higher Core-Clock than having double the Cores with a lower Core-Clock. 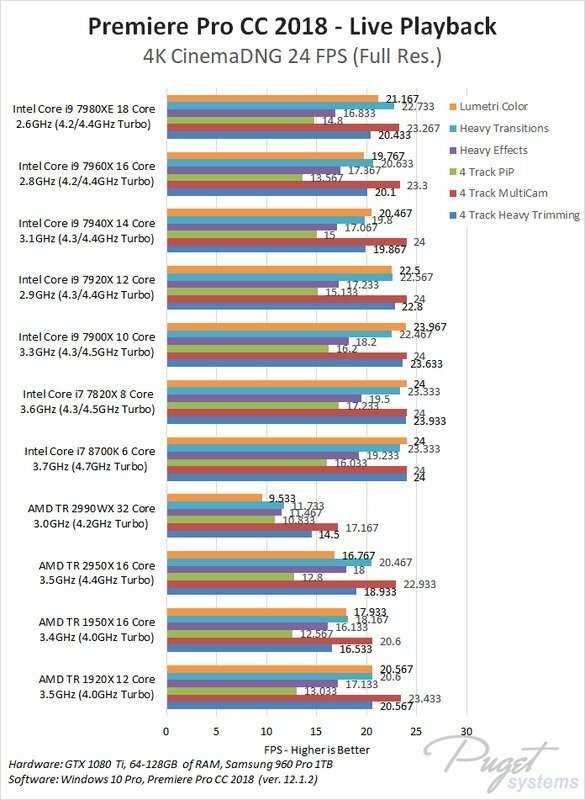 Both the AMD Threadrippers 16-Core and 32-Cores, as well as the Intel Core i9 16 and 18-Core CPUs have a solid lead over the higher clocked but lower-core-number CPUs such as the i7 8700K. This time the RED Media Results are comparable to the non-RED Media Performance. The i9 9900K is the currently best CPU for Video Editing, especially given its Performance / Price. It has high Clocks (Up to 5GHz Turbo Boost on limited Cores) which is great for calculating your Timeline-Effects and it has 8 Cores / 16 Threads which seems to be high enough, to also be great in exporting and encoding / decoding your Video Files. The AMD Threadrippers, especially the 2990WX and 2950X are an excellent choice if you are handling RED Media more often. 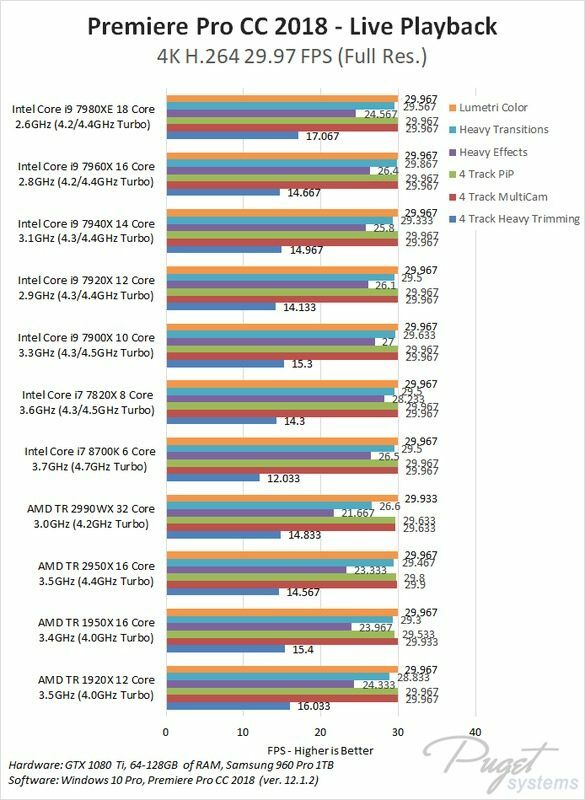 Intel’s i9-X Series with the i9 9980XE are great too and share similar results with the i9 9900K but come at a much higher price. If you can spare the cash to get an NVMe SSD, this should be at the top of your buy list. These type of SSDs offer excellent speed, especially when you are working with large footage. Get SATA SSDs for your OS and Software and HDDs for backing up your Data regularly and you should be all set, storage-wise. As discussed above, Video Editing is not very dependent on the performance of the RAM, but dependent on having enough of it. Any DDR4 RAM will be more than enough for Video Editing, but be sure to get enough of it! I would set 16GB of RAM as a baseline for small Projects with lower resolutions < 2K, but as soon as you get to larger Footage, that also has 2K or higher resolutions, you should be getting 32GB or more. Especially with 10Bit Footage, RED Media, 4K, 8K Footage you’ll be happy to have 64+ GBytes of RAM. As was benchmarked recently, Memory Clock Speeds and Memory Channels don’t impact performance all that much. You might gain 4% performance increase on optimal settings, but usually pay a large premium for doing so. We didn’t talk about Graphics Cards in Video Editing all that much yet. The reason being, that GPUs still don’t have a huge impact on any kind of Performance improvement when Editing Videos. and having a multi-GPU Setup does not benefit you in Video Editing. If you are GPU Rendering in 3D then again, of course Multi-GPU setups will scale almost linearly! I recommend an Nvidia RTX 2070, as this is a fairly strong GPU, that ranks top in price/performance in a multitude of Benchmarks across many different use cases. Anything above an RTX 2070 will be much more expensive for just a very few extra performance points. 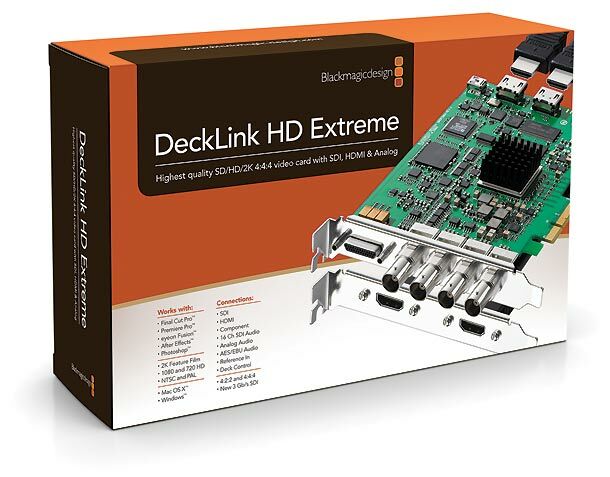 If you would like to go the GTX/RTX way for your standard workflow and Monitors, but would still like to output to a 10Bit Reference Monitor, you can get a Blackmagic Decklink Card. These Cards are made for to HDMI / SDI in 10Bit, but beware, that your Monitor should support your Project Framerates. Decklink Cards are also great for recording hires (4K or even 8K) 10Bit Video in Real-Time if that is something that you are planning on. So a combination of GTX/RTX type of GPUs with such an additional PCI-E-Decklink Card might just do the trick for you and save you some money. The Mainboard in itself should adapt to the other Hardware Components that we discussed above, as it is basically “just” the Hub that connects all of the components together. After you have selected your desired CPU, you can already narrow down the number of compatible mainboards by choosing the right Socket that fits your CPU. You will need a TR4 Socket for example, if you are planning on running a Threadripper CPU, a Mainboard with an LGA 1151 for an i7 8700K or i9 9900K CPU and a 2066 Socket for any type of i9-X type of Intel CPUs such as the i9 9980XE or i9 7890XE. Almost every ATX standard sized mainboard has enough PCIe Slots for your GPU and potential additional Cards, enough SATA Connectors for your drives and usually come with 4-6 + USB Ports for anything external you might need to plug in. Most Motherboards nowadays have at least one M.2 slot for your NVMe SSDs, most have 2 or more. One thing you should look out for if you are planning on using lots of GPUs, of course, is getting a CPU that has enough PCIe-Lanes to support these GPUs. Also beware of M.2 cards sometimes sharing lanes with SATA Ports if you have too many of them running at a time: Say, you have 8 SATA SSDs hooked up, then your M.2 Slot will run in lower speeds or might not work at all, on some Mainboards. But that is something you only have to worry about when you really want to have 8 Drives hooked up. ATX is the most popular Mainboard Size and will fit into an ATX Sized Computer Case. It’s as easy as that! Apart from the Monitor and Input devices, the Computer Case is the main Piece of “Furniture” that will be visible to you and clients or other visitors. It is lots of fun to browse for just the right case with just the right combination of looks, functionality and noise features. As there are so many different Brands and case types out there, I’ll let you pick one for yourself. Be sure your case is big enough to fit your components, but if you don’t go overboard, any ATX Midi Tower or Big Tower will do the trick for you. I often recommend the Corsair Carbide 400C because it is professional and minimalistic looking and has some noise dampening features, but you might prefer a different brand. You save a lot of money from getting individual parts. Here’s a nice Step by Step Video showing you how easy it is to assemble a Computer. Follow this along and you will be done in less than 2 hours. This lower-end Build features the Intel i7 8700K, which is good for Effects Calculation but is surpassed by higher-core-count CPUs in Encoding / Decoding and overall Video Editing Speed. 32GB of RAM is quite good already, but feel free to save some money here and go 16GByte, if your budget is tight. The Storage System is split up between SSD for OS and Applications, NVMe for Footage and an HDD for Backup and Storage. 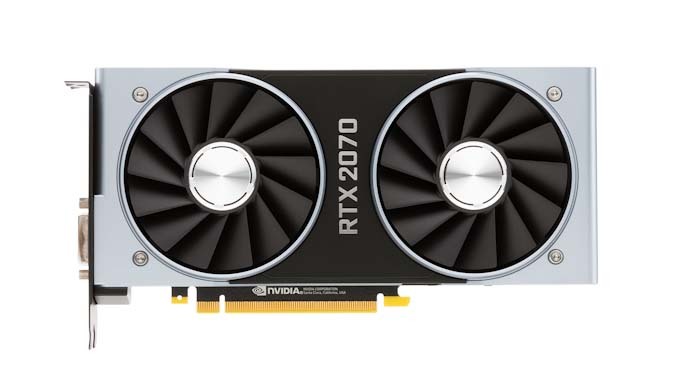 To save some more money, I added the Nvidia 1070 instead of the recommended RTX 2070, but you can feel free to build in an RTX 2070 if you have the extra 100$ or so. The i9 9900K is an excellent CPU for Video Editing. Although it doesn’t have as many Cores as an i9 7980XE or an AMD Threadripper, it has an extremely high Core-Clock, that makes up for the lack in Cores and speeds up Effects Calculation extremely well. 64GByte of RAM should set for quite some time. If you are only working on smaller-res Projects, you could save some money here and downgrade to 32GBytes, of course. Same with extremely high-res Projects and large Footage Data 4K – 8K, you might want to upgrade your RAM to 128GByte. BUT you will need a different CPU and Mainboard for that. 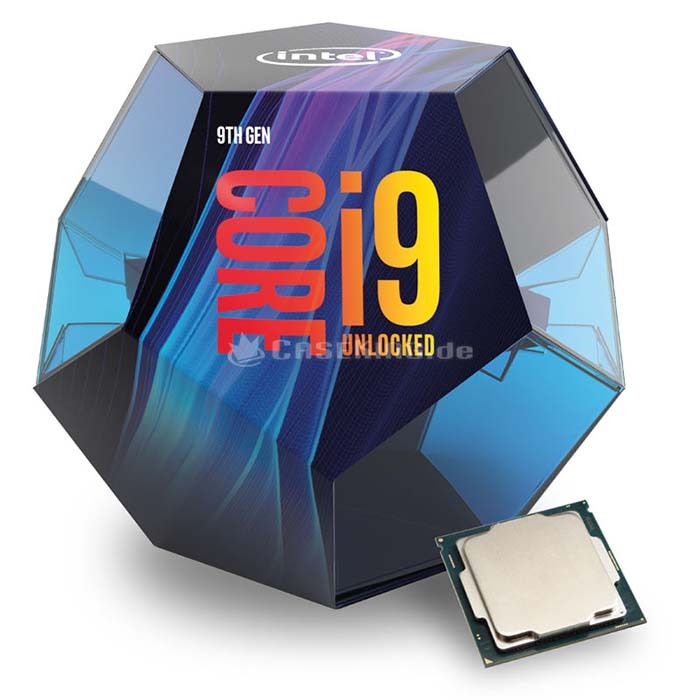 Intel i9 9xxx-X Series (like the i9 9980XE) would be the way to go then on the 2066 Socket (Expect a heavy price increase though). There are many RTX 2070 Versions from Asus and one of the main differences between DUAL, TURBO or STRIX is the cooling solution. If you plan on getting more than one GPU, you will have to stack them on top of each other. Here you should opt for the TURBO variant as this is fitted with a blower style Cooler that performs well in these situations. Go Open Air Cooling solution (as with the Dual and Strix Variants) when you only use one GPU in your PC-Case. This is a high Core-count AMD build. You could even bump up the CPU to a Threadripper 2990WX if you think you need double the cores for Video Editing or plan on using this Build for 3D CPU Rendering and other high-core-count optimized Workloads. The Noctua CPU Cooler keeps the CPU nice and cool while producing almost no noise unless you kick the build into rendering. The Storage is split up into 3 Drives for OS (SSD), your Footage on an NVMe Drive and the HDD for Backing up your Data. Featuring the Intel i9 7980XE that already costs around 2000$ in itself, this Build comes at a price but delivers great performance across all workloads in Video Editing. You will get fast Encoding / Decoding, Live-Playback, Handling of all kinds of Footage Types and quick Effects Calculation. The AMD Threadripper Build above might handle RED Media a bit better and have a better Performance / Price Ratio, but apart from that, this build will give you pretty much the absolute best, money can buy for Video Editing on a Consumer Level. 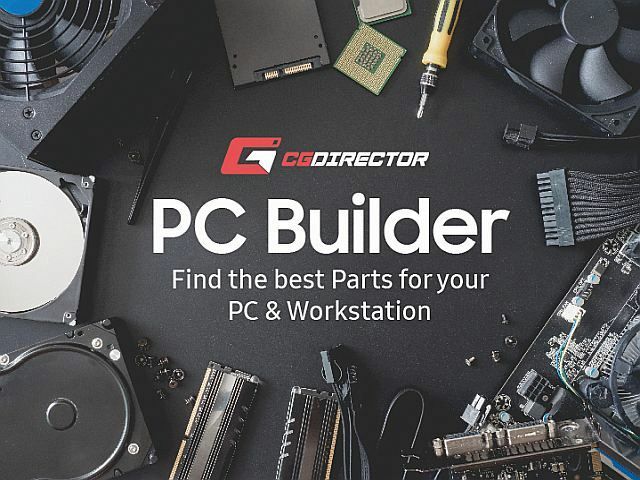 If you want to get the best parts within your budget you should definitely have a look at the Web-Based PC-Builder Tool that I’ve created. That’s about it! What Computer are you building? What do you think about the specs on Digital storms prebuilt Lynx level 4 build for an editing rig? its at the $2000 budget range. Or if there is room there to take away some things and put the money elsewhere in a similar build. Looks pretty good. I would want to change the i7 9700K with an i9 9900K and up the RAM to at least 32GB, but other than that, looks fine! Though now that I look at their page, I don’t think they offer these kind of changes. Or am I wrong? 3) I always record my entire activity throughout the trading period by a screen capturing software. 4) Sometimes I prepare videos for my youtube channel for advertisement of my business. I need a ROBUST and FAST computer for my trading system. Pls recommend me the whole configuration. The GPU can drive a lot of Monitors (up to 4 I think) and every Hi-res Monitor can have multiple Windows on it at 4K. Hi, Alex! Im buying your 2700$ configuration but I cant find “Corsair – 760 W 80+ Platinum Certified Fully-Modular ATX” here in my country, Could you suggest another model? Thanks!!! Alex, thanks for the article. Ironically enough, I purchased a Z6 from Nikon along with a Ronin S gimbal to start doing some video edits for our sports club marketing. I have a i7 based computer I built probably 5-6 years ago and haven’t done much in Premier Pro in over 3 year until last night. Shooting at 4k, I got a blue screen of death within a matter of 60 secs (after about 59 secs of stutter just trying to preview a clip) – about the only thing I didn’t see was smoke come out of the case. So I am in the market for a new rig. Having said that, I am crazy busy and not as price sensitive as some (e.g. if I could get a pre-built for a few hundred more, I would do it in a split second). So finally, my question – are there any pre-built options out there for the $3-5k range that can be configured accordingly without being a complete ripoff (I know that is relative)? and how much of a premium am i going to pay (if this scenario even exist)? I know the answer is probably “build it yourself” as I have done in the past… but thought I would ask. It seems off the shelf options have closed the gap in recent years vs. building from everything I hear – but that is all hearsay. Unfortunately, I have not come across any pre-built workstation pcs yet, that would be worth buying pre-built. Usually Gaming pcs are the ones that are closest to self-build prices, but they come with lots of LED RGB bling, side glass panels and are usually underequipped in RAM and Storage, especially for Video Editing. Then there are sites such as dell, hp, pugetsystems, boxx and so on, that would be able to build good workstations with great components, but they usually cost between 30%-50%+ more than building yourself. Maybe if you stumble upon some good deals you could let me know! I would be more than happy to be able to incorporate some good and valuable pre-built systems into my articles. If I’m going to have two drives one for OS/software and one for media, will I notice any performance advantage by having the OS/software (adobe suite) on an M.2 as opposed to a sata ssd? And how about the media/footage? I would get M.2 if there would be a noticeable difference in performance but don’t want to throw extra $ at components that are not really necessary. There will be almost no difference for the App Drive (just for starting apps) but a good difference for the Footage Drive, as this is where the constant reading and writing of the Footage happens. Having an M.2 Drive that can sequentially read at 3200MByte/s compared to a Sata SSD at 500MB/s will help you on your projects and realtime scrubbing / playback. I spent a month building the best affordable option for my brother who works with video editing. Your arcticle was very helpful to me. But afterall the computer is not reaching the results I was waiting for. I really think the problem is the Windows 10 LTSB, but is it possible? Can you help me with tips on some optimization? The Parts look excellent, should work fine. What kind of performance issues are you encountering? The Win10 LTSB I think is just a Win10 Version that doesn’t update itself, but it shouldn’t slow down your PC. Hi Alex, I am similar to Wayne however, here goes, I have a bunch of those 8 mm film tapes and a camcorder to play the audio video output but can’t figure out how to get this audio video signal into a pc so I can convert to files on my pc? Any suggestions? Once hooked up to the PC you can use any Video Capturing Software, such as Premiere Pro to record what you are playing back on the Camera. Hi Alex: I assume I do not belong on this site with my question, but here goes: I am 84 years old and recently had 203 boxes of 8mm film converted to DVD. All film is from the period 1955 – 1981. Also, I have about 4300 photos that need touchup before rendering to DVD. I took lessons in 2005 on Photoshop 5 but never followed up. I believe I should use Adobe Photoshop Elements and Premiere Elements for my ragged collection. Could you recommend a build for around $1700. You can do some more tweaking especially in the Storage area, if you already know you will need more storage than 2TB to process all of the films and photos, though this build should get the job done well. Hi, I love this article and i’m going to use it as a guide to slowly build up my $400 asus z370-p based pc over the course of the next 2 years until i get to the $2700 intel build you suggest. but i have a question. You have paired an i9-9900K cpu with DDR4-3000 ram, yet intel’s website says it goes with DDR4-2666. is your choice based on overclocking or has intel made a typo on their site? CPUs have a base RAM Frequency at which they are rated, 2666 in Intels i9 9900K case or 2133 on an AMD Threadripper CPU. RAM though can always be overclocked giving you a slight performance boost. So you can run RAM at 3000MHz or even higher, depending on what type of RAM you get. This impacts AMD CPUs much more than Intel CPUs though, as they have components that are dependent on the Memory Bus speed. You can always get 2666Mhz RAM if you want to, as the performance difference really is marginal. Thanks Alex, that makes total sense and really helps me out, I’m starting with a g4920 cpu, then as my budget allows I will be moving up via an i7-8700k before ultimately reaching my target of an i9-9900k. Therefore if I can use ddr4-2666 ram throughout the whole process it makes things a lot easier for me. Beginner here wanting something similar to your $1,700 build recommendation.unit. Home video and photo editing, maybe a little gaming? Otherwise just general internet browsing and office program stuff. You spec a second M.2 SS drive, but I am wondering will this drive work seamlessly with the SATA and hard drives or is this something you need to interface with to use? Also, any recommendations on companies to get something like this rather than to build my self. Sorry for these simplistic questions. Really enjoyed your detailed and informative article. M.2 and sata both work together seamlessly out of the box. No interfacing or additional drivers needed. You can have a look at sites such as pugetsystems and ibuypower to configure your own pc and have it pre-built, though these kinds of sites will always be more expensive than building yourself. Thanks for the informative article. Looking at upgrading my current video editing PC and building the $2700 Intel machine, just curious, would you recommend swapping out the Noctua – NH-D15 82.5 CFM CPU Cooler for a water cooled system? Would either of these fit in the Carbide 400Q ATX Mid Tower Case? Yes both will fit. 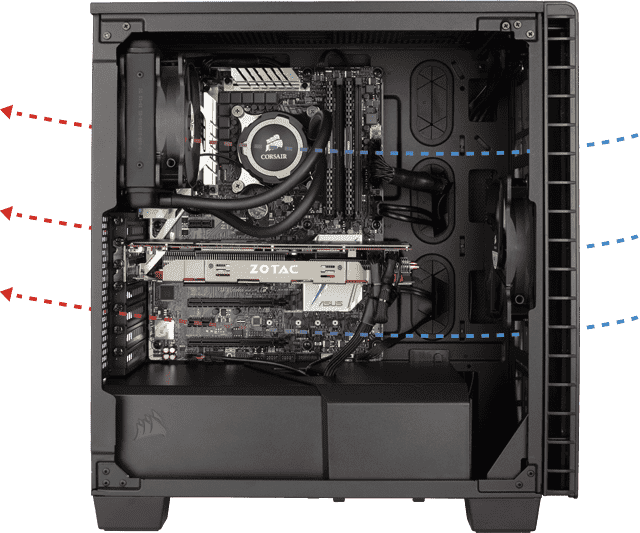 The Carbide 400Q has room at the top, front for larger aio coolers and at the back for a small aio cooler. A very helpful and thought provoking article, especially since I do a lot of 4k video editing (hobbyist rather than professionally). Up to now I have been very happy with my custom built PC – Intel core i7-4790 CPU @ 3.60 Ghz, Samsung SSD 840 EVO 500 Gb, NVIDIA GeForce GT 740 GPU, Windows 10, 64 bit operating system, 16 Gb of RAM. However, I recently purchased 2 new cameras (GoPro 7 Black and DJI Osmo Pocket) giving me the opportunity to shoot 4k video at 60 frames per second. And therein lies the problem. Editing and playing back 4k 30 fps has been a breeze despite the somewhat outdated spec of my PC. When I edit footage taken at 60fps everything seems to take longer (perhaps no surprise as the file size is more than double that of footage taken at 30fps). And my 4k PC monitor cannot cope with the video playback – its very jerky (although its fine on my 4k TV). I’ve tested different open source 4k playback PC software to no avail. So either I stick to 4k footage shot at 30 fps – or I upgrade some of the components in my PC. But which one first – CPU, GPU, or RAM? Do you have any advice for me please? PS: apologies in advance if some of my points/questions seem a bit dumb – I’m not that tech savvy. I’d do some analysis first before you get new components so you know exactly where in the pipeline the problem lies. When you say 30fps runs smoothly but 60 doesn’t this could mean that either the cpu can’t decode your footage quickly enough, the cpu can’t process and display your footage quickly enough, your ssd can’t load the footage quickly enough for the cpu to process, or if you cached the footage already, the RAM is not enough for caching. Also the jerkyness off your 4k output can have different reasons. Either the footage is not loaded quickly enough (as mentioned above) or your monitor refresh rate or playback software somehow clashes with the footage fps. Feel free to exaggerate and compress your footage down extremely with different codecs for testing and see when your stuttering goes away. This should already tell you a lt of what is going on. I’m moving from editing HD to 4K. I’d like to be able to edit a 3-camera 4K shoot. I’ve been using an HP 450f with an Intel i7 870 and 16GB memory. I’m sure this won’t cut it for a 4K shoot. What do you recommend for 3-camera 4K editing? it depends a bit on what type of Footage you have. RED works best with Threadripper CPUs, everything else works better on Intel CPUs. The best overall CPU for this type of work that you can get on the consumer market is the i9 9900K. 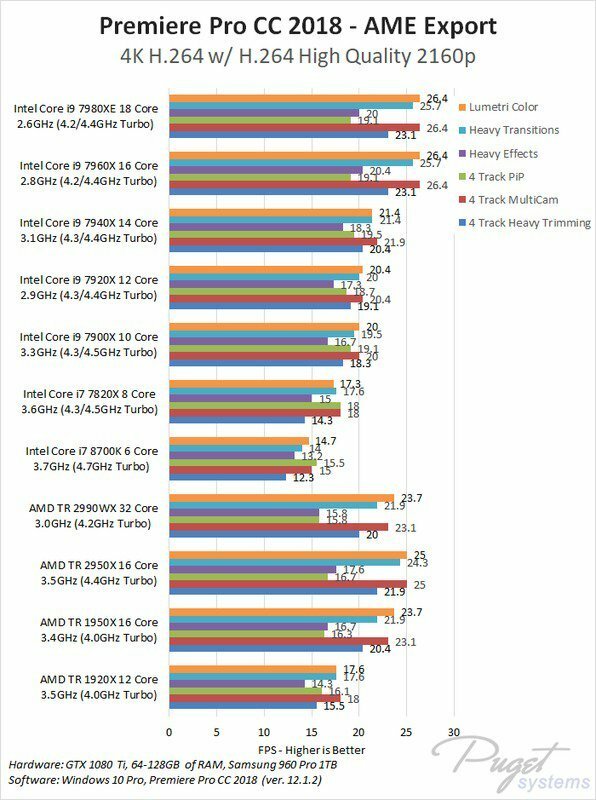 Can you do a test comparing 9900k Vs Threadripper 2950x with similar Hardware. 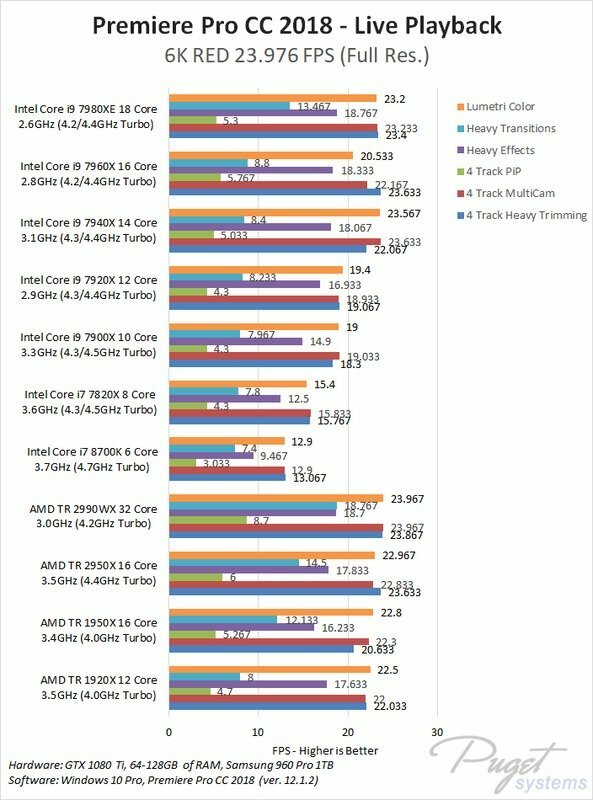 These seem to be the 2 CPU from opposite sides that come up a lot and it bugs me as I want a new build, and not sure which route to take .I love the race TR has 16 cores and could be really well future proofed. Any updates for the 2 CPUs would be great. A side by side comparison . Great article by the way. Hello Alex, could you help me with the motion settings with premiere? It seems like when I try to use the motion settings the pixels seem jagged while it moves across the screen. Is there a way to make it more smooth such as adding more frames, using a certain codec, or graphics card? I am using 8700K with a Vega 56. Win10. Unfortunately I am not quite sure what you mean? Do you have a screenshot or short video showing the problem? I was going to buy a Puget Systems rig for editing 4k videos, primarily GoPro footage 4k 60 fps, on Premiere Pro and After Effects but you got me thinking! Maybe I can actually build this thing myself and save lots of money. Here’s what I got so far. I combined some of Puget’s system with your suggestions. I’d love any advice and your opinion on this rig and of course if it’s actually compatible. Tell me what would be better. Total cost of these parts on Amazon: $4,200. Good for you! That’s a solid build, I see no issues 🙂 Let me know how it works out! I’m literally purchasing the 2.700$ setup you put together up here (thx btw). One thing: you added a Asus Nvidia Geforde 2070 RTX 8gb video card. Is that DUAL or TURBO? cause I found multiple versions of that card and they heavily vary in prices so I’d pref picking the right one – whcih is it? Thanks for the Feedback, I’ll update the Article! Go with the TURBO if you plan on adding more GPUs in the future. The Turbo Version has a blower style fan, which is great if you have multiple GPUs stacked on top of each other. It gets the Air from inside the case and blows it out the back of the GPU outside of the case. Get the DUAL one if you only want one GPU. This has Open-Air type of Cooling meaning it gets the Air from inside the Case and blows the Air out all of the sides of the GPU, with most the hot air staying inside the case. This type of cooling is usually less noisy but produces too much heat when you use many GPUs stacked on top of each other. I friend advised me to purchase a pc case where I can exchange the SATA hard drives via the front side for backups – which seems to make sense – cause it’s way faster than USB 3.0 and more convenient than having to open the case everytime. I also wanted to purchase the Fractal PC case because of the reasons you’ve given and I also like the design. I’m a noob so thanks in advance and help is much appreciated. You will need a 5,25″ Drive bay though. I am not sure what PC Case you are looking at currently, but be sure it has at least one 5,25″ Drive bay. I heard that the 600 Mbyte/s is just the technical side of the story and that it’s effectively less when actually transferring data. And that if you back up hundreds of gigabytes (which happens fast with current 4k, high res, footage / graded edited videos, etc.) that it will take forever to back it up – that is why I was asking. But then again, I’m new to this and was just trying to get different opinions. Since you probably have way more practical experience with that it would be just fine for me to hear how you back your data up and if USB 3.0 will be enough for regular (weekly-monthly) backups / if you think that it will be enough for my purposes. What I have been doing successfully for many years it use a USB 3 / 3.1 Docking Station (such as this one: https://amzn.to/2Sbj5CG) where I can easily insert and swap out normal HDDs and SSDs. I can turn this docking station on in the evening, do a daily backup. Then on the weekends and on the end of the month I have other drives that I plug in and do a weekly and monthly backup. This way I have drive noise only when I need to backup my data. As the drives are only on a short period of time I also reduce risk of Virus invections and cryptolocker. I store the monthly backup in another house, the weekly backup in another room, and the daily on top of my pc. I use FreeFileSync for backing up the data that I can highly recommend. I have to buy 2 strong PCs to start my new business. Now, I have 2 PCs working a little bit slowly. I use the Suite Adobe (AfterEffects and Premiere Pro especially), Actually I use much more AE than PrPro. I have some troubles about using the 3D Element Plug In and about the workflow, it’s really hard work on 4k or with a lot of animations. I don’t really care about rendering time because it doesn’t take so much time. I prefer Invidia because it has the CUDA driver which improve the speed. At least this is what i understood. Can you give some advises about what would be better? Can I add more RAM and maybe an other GPU? Those are the parts that I would have recommended also. For AE and PP Work there is no better allround CPU than the i9 9900K currently. The Platform unfortunately only supports a max of 64GB of RAM. If you need more you will have to go HEDT Platform with a Threadripper or Intel X-Series CPU. These might be slower for active work though. You can definitely add a second GPU to the build, though beware that many plugins don’t support multiple gpus and might only use one. Of yourse GPU Render Engines make full use of all gpus, but I am not sure about the 3D Element Plugin. You might want to ask the plugin vendor to see if it can make use of multiple gpus. Thank you for the answer. I will buy theese components! It seems the perfect configurations ! Unfortunately i checked, and i found out that element 3D works only with one gpu. So I think one gpu is enough. About the workflow, does another gpu help? I mean, talking about creating animation and other stuff on AE, can it make it faster? Or it would end up not being used? In AE, only one GPU is usually used. If you do anything in 3D Software though such as Cinema 4D with GPU Render Engines, these can make good use of more gpus. But ae or pp not really. Yes this is an excellent Build for Video Editing, if money is not an issue. The 7980XE can be swapped for the 9980XE. 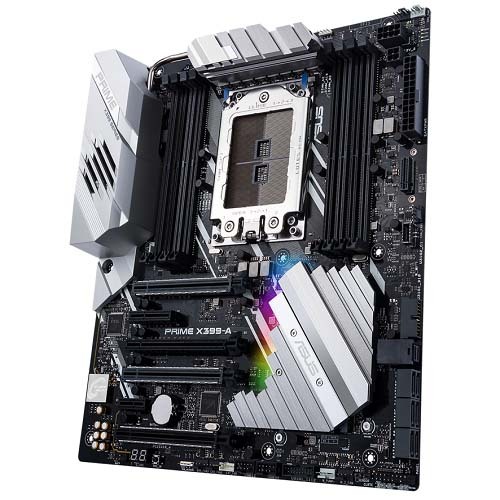 The PRIME X299-DELUXE ATX LGA2066 Motherboard is compatible with the new 9980XE CPU, BUT you will most likely have to update the bios to use it. Might be that these Mainboards aren’t available yet, but should be shortly. If its Dual Xeons you are thinking about, these only help you in tasks that are greatly optimized for Multi-Processing. Everywhere else you will need high-core-clocks. The i9 9980XE is a great combination of both. It has 18 Cores and a fairly high-core clock. You could of course get dual Xeons and have even more cores but wouldn’t be able to work as fast as with a high-clocking HEDT CPU. What is more important to you. Attended tasks such as active work, or fast cpu-rendering but slower active work? so you convinced me a little more to build my own pc. I really like these builds: Best Computer for Video Editing, AMD 3000$ or Intel 2700$, preferably the AMD version. But besides video editing I am also doing a lot of 3d stuff with blender. Octane/c4d are on my wishlist as well. I looked at your pc builds for 3d modeling and rendering. But I guess the “Computer for Video Editing, AMD 3000$ ” is overall a better choice compared to the 1500$/ 2300$ AMD cpu build (3d modeling/rendering) in your other article? As I have a budget of 3000$, I want to invest in a really good one. I’m looking forward to your answer and thanks for all the information!! It depends on what you mainly do on the computer. A more expensive Computer is not necessarily better at the tasks you are planning on doing. When CPU Rendering, yes the more expensive, the better the CPU gets. When wanting snappiness in your active work, then a really expensive CPU is actually worse than a fairly average costing CPU, that has a high core clock. If you are planning on video editing but also want to work fast in 3D Software and have fairly good CPU Rendering performance, and don’t need more than 2 GPUs for GPU Rendering I’d go with a i9 9900K build. If you want to cpu render faster need more GPUs and maybe use RED Footage, then having more Cores, more pcie-lanes and a Threadripper would be the wiser choice. I’d think about it this way: How much time do you spend actively on the pc vs how much time do you usually let it render/encode stuff. If the latter is higher go AMD Threadripper, if the former is higher go i9 9900K. On a side note: We are talking on a high level here. None of the mentioned Components will truly be bad at what you want to do! true, for a start the i9 9900K is actually a wiser choice. And in case I need a stronger CPU in the future, I could just replace it with the AMD Threadripper. Btw: Would you recommend a water cooler for this build? If yes, which one? Dropped by on this website on several occasions and has been very helpful. Like the format! I will probably choose one of your above configuration to build my next system with a few alterations. I want a small and silent workstation. I figured m-atx is small but still powerfull enough for all my needs. Not interested in overclocking. Budget around 2000 euro (not including the monitor). Is there a nice balanced option between all configured systems for photoshop, premiere pro, after effects and cinema 4D. Cause I interchange between those programs a lot. Not sure of my choice in motherboard though. In your configurations you chose a 860 drive for the os and apps. 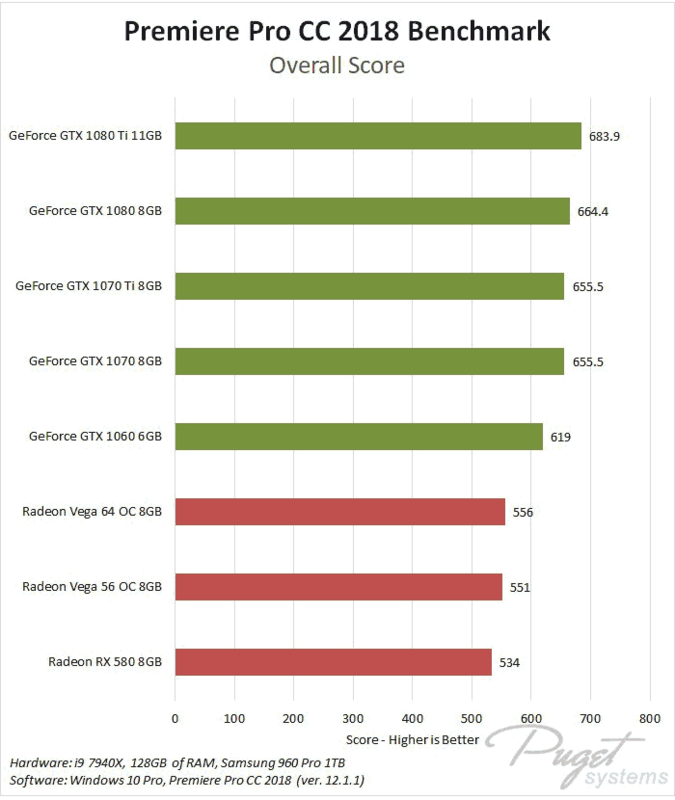 Is there a reason for not putting a 970 in there as well? Or simply put they’re no speed gains and the 970 drive is primarily used for footage / caching / previews / exports? Looks like a solid build! If you have the budget, by all means get more m2 ssds. Though since its only for os and apps, you won’t notice a speed difference all that much. For Caching and Footage loading then again an m2 ssd is a huge time saver. Keep in mind, that the m.2 ssds are attached via 4 pcie-lanes, so having too many of those will at some point take some lanes away from the gpu-cpu interconnect or some of the sata ports. Depending on the Mainboard you get, though it usually says so in the manual and on the specs page. If you are getting one rtx 2070 and 2 m2 ssds though that usually only takes some sata connections away. So you might end up with only 6 sata options rather than 8, which is more than enough usually.